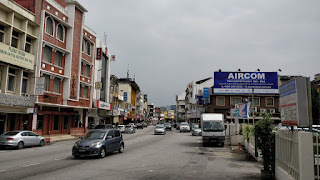 To get to Ipoh we had decided to do the 3hr bus journey. My sickness bands seemed to have worked quite well so far on other transport, and when you book online you can choose your seat allocation, so we got the front seats with a view to the front. 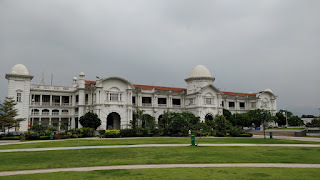 Ipoh isn’t a huge fancy town but we had heard good things about it and it was on the way to the Cameron Highlands, so we decided to stop for a few nights. We were staying at the Ritz Garden hotel, which is a bit rough round the edges but was quite cheap and included a breakfast. It also had the most enthusiastic doorman ever, that dragged me off to show me maps and point out the directions you need to walk in for any of the sights. The hotel does boast of a pool, 3 bars, a library, a cinema and a gym but most of these rooms were locked and empty when we went for an explore, so not sure if they are really used facilities. After a settle in we headed out to figure out the town and to grab some food. The town is quite run down in places and there are a lot of closed or empty shops dotted about but we found the night market setting up (it’s on every night 7pm-2am) and then spotted a hipster-ish looking bar that we stopped in for a drink. The food and drink scene for young Malaysians seems to look much like any English town with mid-range bars offering burgers, fries and other American / western dishes. The big difference is it’s tricky and much more expensive to buy one or two beers. Everything is geared towards buying buckets of 5 or more ½ pint mugs or bottles. Obviously, we had a bucket of 5 mugs! We then wandered back along the road as storm clouds and lightening flashed around us and I spotted a smaller less fancy looking bar called Vampire. 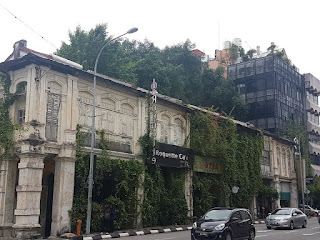 This turned out to be the other type of nightlife that Ipoh offered – Karaoke. Dominated by Chinese songs and happy drunk Chinese clientele, we spent a merry hour or so in here whilst the rain lashed down outside before heading out into the warm rain for a stroll home. We passed the soaked night market and did stop for some rice and chicken at a huge street vender but the rain got the better of us in the end and we headed back to the hotel. The next day we went on the Ipoh Heritage Trail. 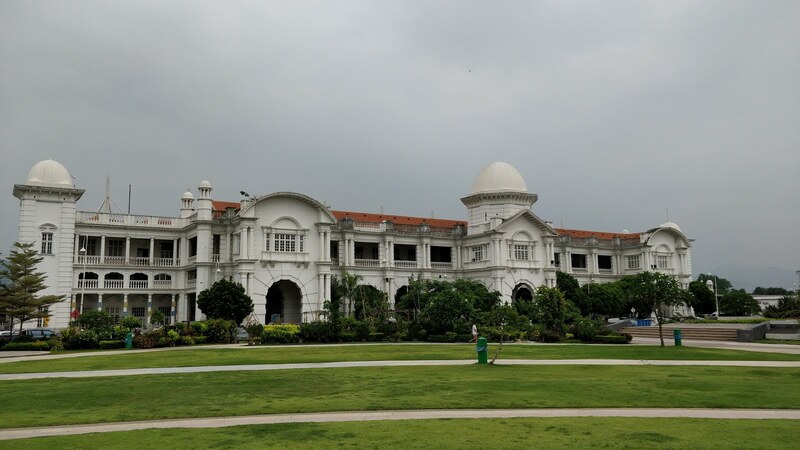 We didn’t actually know it existed but we knew the architecture in Ipoh was an attraction and so headed for the train station as this was a good example. That’s where we found the start of the trail which took us across town to the Town Hall, Law Courts, the Clocktower and various other large colonial buildings that remain intact. 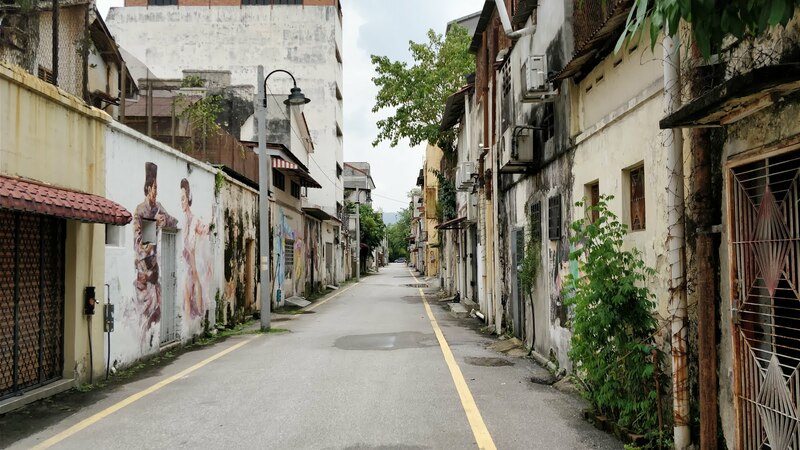 The trail ends in the little streets called Concubine Lane, which used to be where the prostitute and opium dens were. Unsurprisingly this is now full of quirky coffee shops, street art and bistros and we stopped for some yummy fruit smoothies. We then walked back through a lane called Mural art lane, which has some amazing examples of graffiti and street art. After getting back to the hotel I was informed that I didn’t have long to relax as we were heading out again shortly……oh and I’d best pack my swimsuit and an overnight bag! Paul stayed tight-lipped about exactly where we were going and the only guidelines I had were it involved swimming and a night away. 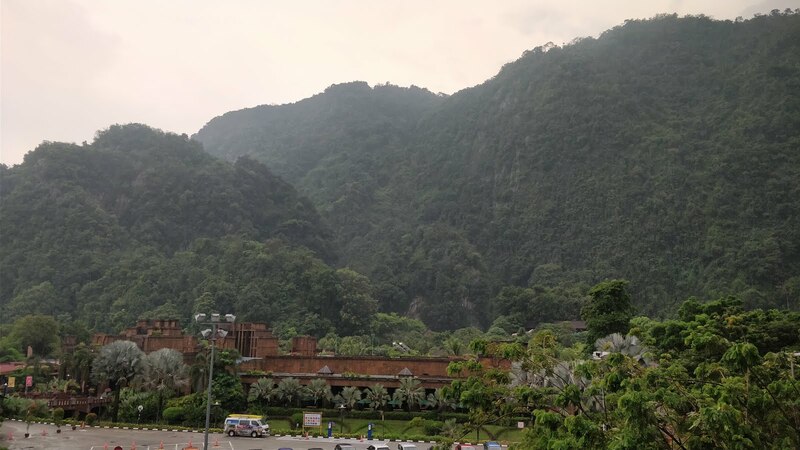 A short grab taxi journey later and we arrived at the Lost World of Tambun, which is an adventure theme / water park set in the shadow of stunning forest covered mountains. Paul had amazingly booked 1 nights hotel with entry to the night hot springs plus entry to the water park and surrounding attractions the next day as a birthday surprise! It was such a nice surprise and a complete break from the norm of our traveling. The hotel was plush and we had a huge room that faced the mountains and the water park - but it had been well designed so all you saw was trees and the entrance building. I won’t bore you with all the details of the park as it is just a huge theme type park with animals and fair rides, fake beach, mega hot jacuzzi, food stalls and water slides but it is a very well done one. They have spent a lot of money making it tie in with the surrounding jungle, adding in little details to make the fantasy land come to life. I’m not a big fan of captive animals, especially at a family aimed theme park and I was expecting the worst when I walked round their ‘petting zoo’ but I wasn’t too bad. Most of the animals looked well looked after and their enclosures were adequate. Their 3 tigers looked bored and unhappy but overall their smaller animals and reptiles were in good condition and it looked like they had put the animals first. The luminous forest only opens at night as it’s forest walkway all set up with fairy lights and UV painted flowers. It was just like being at a festival and very pretty. The highlight of the night was the fire show, which was the best one I have ever seen. 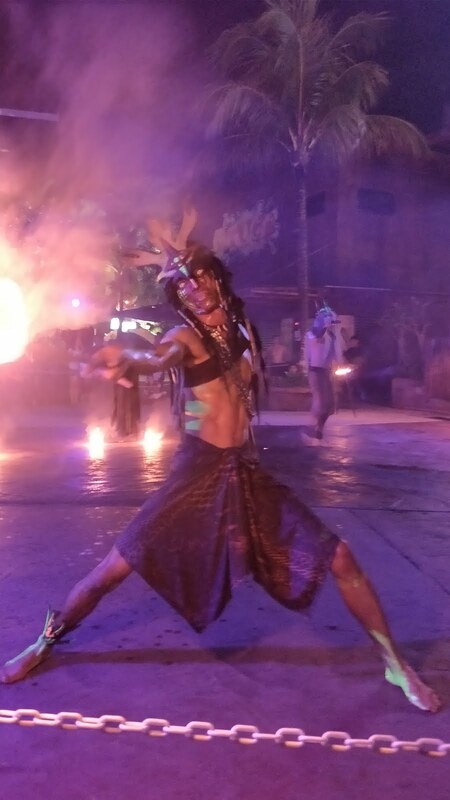 We’re only talking about 5 people doing fire or laser poi and one fire-eater but they must have broken every health and safety recommendation you can think of. The fire-eater guy was phenomenal, and would hold an insane amount of fuel in his mouth whilst others did their bits before he would light up the stage in fire balls. At the end we were lucky enough to be sat next to some staff so were invited to jump the queue for cheesy staged pictures with all the whole group. They even gave us a huge pack of cookies to take away with us for some reason and it felt like a very surreal ending to an amazing night. The next day was spent in the water park doing all the swimming, water slides, jacuzzi and rides again. A special mention for the ‘ghost walkthrough’ which was a set of dark rooms, barely lit enough for you to see your way around. 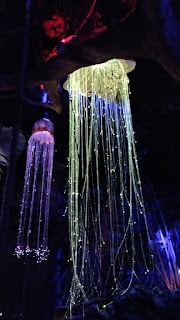 It had UV and glow in the dark creepy hanging items and strange objects to either side of you, some of which might be people dressed up that would touch you as you went by or silently turn to follow you around the rooms. This is all accompanied with the sound of screaming or cackles of laughter. I can’t believe there were kids in there, it was very freaky. When late afternoon came around we left the park and headed back to our other hotel. After another brief but torrential rain storm, this one came with horizontal forked lightening, we headed back to the same bar we’d found on the first night. I know that’s a little bit sad but there aren’t many places to have a birthday alcoholic drink and as soon as I saw that they did a Pork Platter, I’m afraid all other plans went out the window and we stayed there. After an amazing dinner we walked back and decided to stop at one of the ‘fun pubs’ that we had opposite the hotel. We’d heard rumour that there was a brothel near the hotel but hadn’t seen one, although we kind of suspected that it might have been one of these pubs. We went into one called the SKS bar as it looked very busy. It was exactly like something out of the local shop at Royston Vasey as everyone stared at us as we picked our way through the red lit room towards a dark bar. Chit chat did resume as we got 2 bottles of tiger for some ridiculous price and we then watched an amusing scene of very drunk men being served over priced drinks by very friendly girls. I’m still not sure if there was a brothel attached but the large manager certainly had a lot of attentive bar girls working there. We only stayed for the 1 drink, then left everyone to it. All in all, it had been an amazing and different birthday in Ipoh Malaysia. 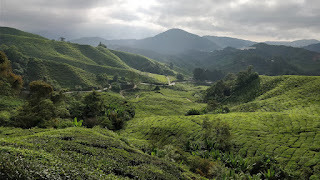 Next day we were heading to the Cameron Highlands. 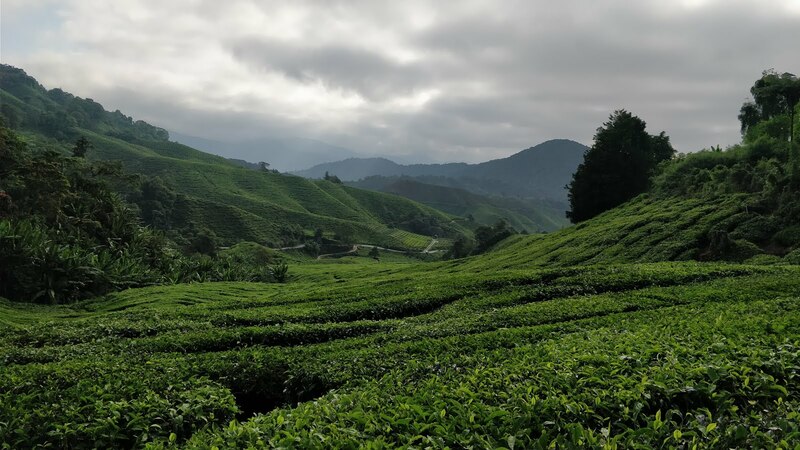 This area was developed in the British colonial period for tea plantations and farm land and it remains the place where 60% of Malaysia vegetables are grown. Nestled about 1600 metres above sea level the temperature up there is a far more pleasant 23-25 degree and the views are stunning. Our bus was about 20mins late leaving Ipoh, and when it came in from Georgetown we discovered that people had sat where they wanted and so someone had nabbed the front seats that we’d booked. The lady did move as soon as we said we’d booked these specific seats, although I slept the entire journey up so probably didn’t need to be at the front anyway. We’d booked the Snooze hotel in Brinchang, which was 1 town back from the bus drop off depot, it’s only an hr walk but with backpacks on we decided to get a taxi. 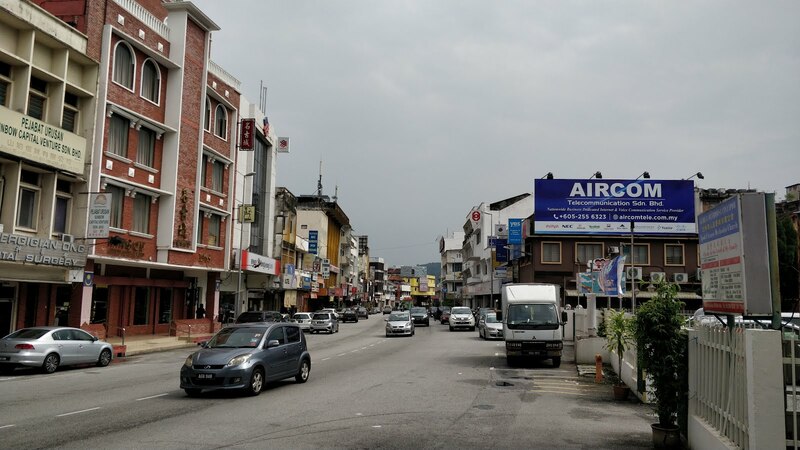 The traffic in the 3 towns of the Cameron Highlands is awful at the weekend due to a street market up near Brinchang that has no available parking so cars, buses and transport goods must navigate abandoned parked cars, wandering people and oncoming traffic. Our taxi driver told us this was only going to get worse as the local government had decided to use the land that was going to a be a carpark into yet more stalls and shop space. He was a born and bred Highlander and hated seeing his home and people being ignored, as well as turning his 10min car journeys into a 2hr ones at the weekend. He was a lovely chatty guy and he gave us his number so we could book any tours with him directly. Snooze hotel 1 was a compact warren of rooms spread over 3 floors. Each floor had a communal kitchen area with hot and cold filtered water, a TV, couch and book cases. As we’d booked their last available room we were in the family room on the top floor. We went for a walk around the town, which only took about 15mins, then went for Chinese at a place the taxi driver had recommended. 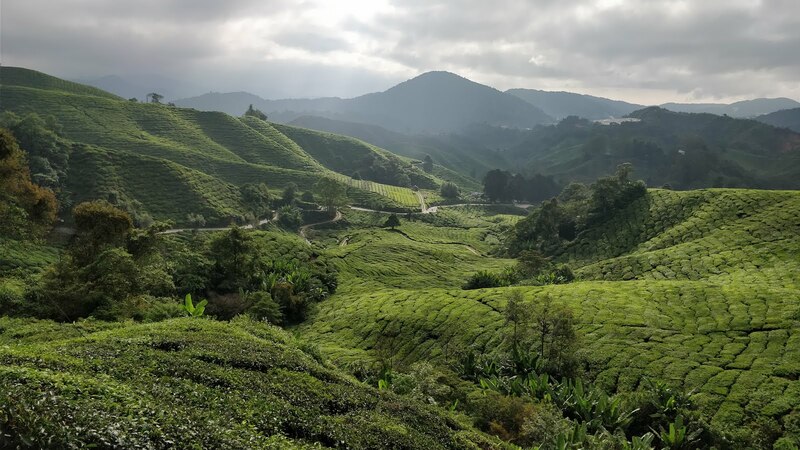 We already knew that if you aren’t trekking in the forests there wasn’t a lot to do in CH but the draw of lower temps and beautiful views before hitting chaotic Kuala Lumpur was very appealing. 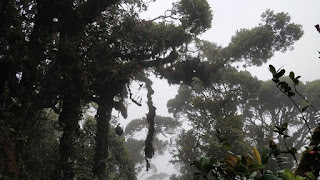 One of the things we wanted to do was go up to the Mossy Forest and as our taxi driver had said an early start for this was essential, we gave him a ring to book that for the following day. He wasn’t available but said his friend with a 4x4 who could take us around for the day, pick up was at 8:30. I know 8:30 isn’t strictly that early, but we have become rather lazy with our morning routine of late and getting up was harder than we liked. We had a quick breakfast of Dim Sum, which was delicious and then met Raju our driver. The Mossy Forest is basically a walk through the forest on the slopes of mount Gunung Brinchang. 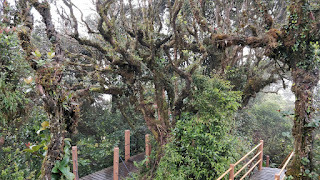 A portion of it has got wooden walkways and platforms that enable you to see the rich trees, carnivorous pitcher plants, moss and lichen that grow there. If you are lucky the clouds will part for amazing views, but generally it’s covered in a fine mist that makes it dark, damp and seem like a fantasy world. I loved it. Not that we would have attempted it but it seems a lot of the hiking trails have been closed recently, the one leading off from the wooden platforms was closed due to a landslide – there was nothing to stop you walking on, but probably ill-advised to do so. 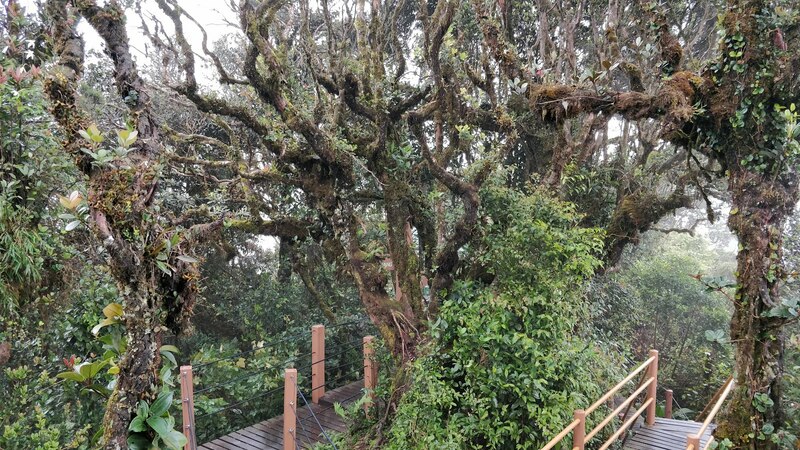 After the mossy forest we stopped at the BOH tea plantation. 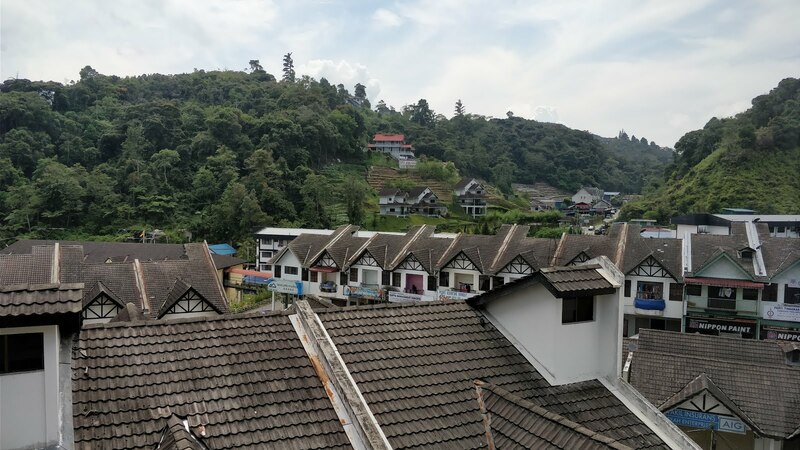 We’d had to drive through it to get to the mossy forest so already had pictures of the undulating green carpet of tea trees, but now we stopped at the main buildings. Raju took us through the factory and explained about the drying and sorting process before leaving us to explore more and get ourselves a cup of tea. It was actually quite interesting and the tea and cheesecake were excellent, but it’s the views that were the best bit. On the way back to our town we stopped at a Butterfly Garden, which sadly just seemed to be a way to squeeze some more ringgit out of tourists. The butterfly bit was a little upsetting as the ground was littered with dying or dead butterflies. I will admit there were a lot of live ones flying around as well but after I’d picked up a couple that literally dropped out of the sky it was hard to enjoy them. They also had a few glass containers with various beetles in them and I had to find a worker to warn them that 2 were on their backs, unable to right themselves. We didn’t hang around long and after leaving we got dropped off at our hotel. The next few days passed lazily with a trip to one of the Strawberry farms, where we sampled their hydroponically grown strawberries – not as nice as English ground grown ones. We wandered around town, did washing etc, walked to the next town and ate amazing Bangladeshi food at Singh Chapati and found a traveller’s pub for some beer. On our last night we decided to try to what every restaurant seems to be advertising – a Charcoal Steamboat. 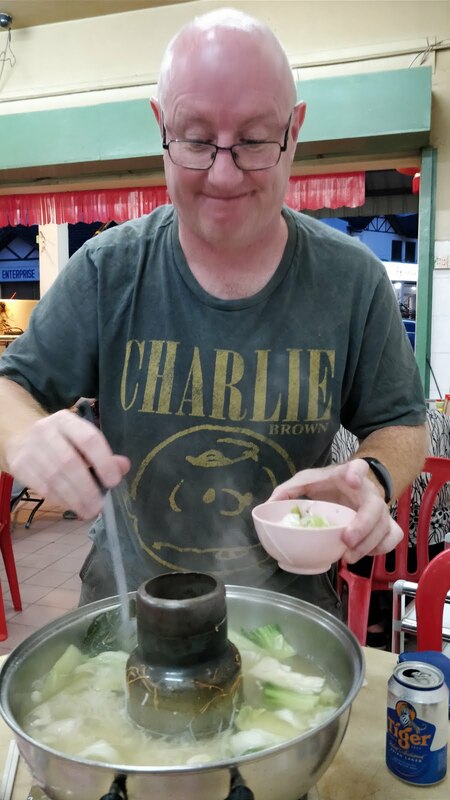 This is a Chinese dish I believe and is basically a hotpot of stock that you have over a charcoal fire in the centre of your table and you cook your own meat, fish, eggs and veg. After a while you fish items out and eat them then add some more in to cook - repeat until you are full. We had no clue what some of the things were that we were adding to our boiling stock and the owner didn't seem to know either but the more we added, the tastier the stock got. It was delicious, filling and quite cheap. I enjoyed the Cameron Highlands, not just for the cool temperatures but for scenery, people and relaxed feel. The hustle and bustle of KL was calling though, and I was really looking forward to what we were going to find there.